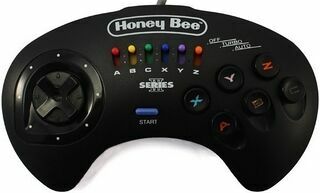 The Series III is a third party control pad released in the early 1990s by Honey Bee. In the west it was distributed under the Competition Pro brand as the Professional Control Pad Series III (a "successor" to the Professional Control Pad Series II) and a model by Halifax known as the Virtual Joypad (or Virtual Series III) has also been spotted. The Series III is a six button controller with turbo support. Both black and transparent variants of this controller exist.